Did you decide to rent a storage unit in order to temporarily place your belongings there? Did you wrap everything properly? Poor wrapping can cause damage to furniture at best or can create a breeding ground for termites, flees and bed bugs. In order to avoid loss of good furniture and money follow () tips of packing belonging for storage. Before packing a single thing, you must conduct a thorough inventory of what you are going to store. Divide everything by category of storage, what is going in the box, what is going to be shelved, etc. After conducting an inventory and dividing everything, make sure you don’t lose track of what you are packing and where. 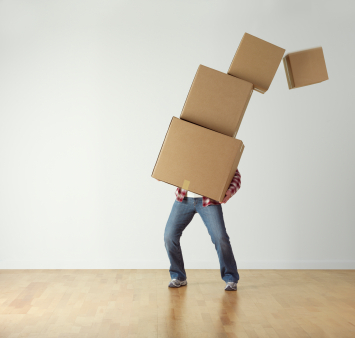 When you are boxing up your belongings make sure to cushion them if you are storing anything besides clothes. IF you are boxing up CD’s, vases, toys, etc you must insulate them with packing cushion. If you are packing the box, make sure to wrap it in plastic to avoid moisture seeping through. If you are storing tables, desks or anything else you can’t box up, you must wrap everything with plastic wrap and then bubble wrap to double the protection and avoid any damage. Make sure to wrap everything tightly in order to ensure that the wrap will not move easily when it moves. In order to secure all your belongings you must close everything with two inch think storage tape. Masking tape and cellophane tape is adhesive enough to secure the packaging. It is thus recommended to use a strong, professional brown or clear brown tape. The goal here is to protect all your belongings from any outside environment. The packing should be done the same way as you would do if you were moving. There is nothing worse than packing something and not knowing where you packed it in to. Imagine coming back to the storage unit and looking for one pen that you have packed in one of the three boxes. If you haven’t labeled everything in detail then you will not ever find that pen. Many don’t understand what proper labeling means. Mark each box with the detailed list of what is in it, color coordination can help keep things organized. The best way to do this is by placing a checklist on the box. It’s often easy to think you can remember everything you put inside the box, however as time passes you will forget. Keep a duplicate at home of all your inventory checklists, that way you will know what is where and if the item you are missing is in the storage unit or at home.